It's always something we think "happens to other people". We hear stories about it but we feel like it won't happen to us because we are careful and always put ours in a safe spot. Well, I have been travelling quiet a lot for the past 7 years and that's it, it happened to me in Vietnam, I lost my passport!... but then I got it back! As you can read on this post and on that one, while I traveled through Vietnam I rented a motorbike for 2 weeks and rode in Northern Vietnam. Everything went just fine, but on the very last day, the small bag in which my passport was fell out of the pocket of my jacket that I simply forgot to close, not even not properly closed, I forgot to close the pocket!... When I think about it, it's quiet amazing that I've never lost my passport before. In this post I will explain to you what I had to do in Hanoi in order to start the procedure to get a new one, but then roll back everything since I got my passport back. The process should be quiet similar in Ho Chi Minh city. The first thing I did when coming back in Hanoi after dropping off the motorbike and cheking-in my hostel, was to go to the closest police station. you can ask the reception of your hostel/hotel, they sure will be able to help you. There, I explained my situation and they gave me a form to fill in English. But there is a part in the form that had to be written in Vietnamese and describe the events. So I went back to my hostel and asked one of the staff to write down in Vietnamese what happened as I told her. The rest of the form was pretty straight forward; name, passport number, date of the loss, location (try to be as accurate as possible) I had lost it on the road somewhere near a village called Cho Chu therefore I was not able to give a precise location but it worked out as well. Once your form is filled go back to the police station to get it signed and stamped by the station chief. Mine is the French embassy. You might want to check online if you need to make an appointment beforehand, but giving the emergency I'm sure they'll receive you if you just show up there. They were very friendly and helpful. I gave the police report, and they told me that I had two options, I could ask for a regular passport that would take 3 weeks to make or for an emergency passport that works the same way as a regular one except that it's only valid 1 year, but I could get it the next day. I took the later option. I had no idea such thing as a passport valid 1 year existed. I always thought an emergency passport was a document that would only allow you to travel to fly back home. Anyway, it was a good surprise and I was happy not to have to wait 3 weeks. I left the police report as well as an ID photo. The next morning, as I was checking in another hostel and got ready to go pick up my emergancy passport at the embassy, I received a call from the rental agency. They told me someone had found my passport and took it to the police. Crazy!!! At this precise moment I was wondering if it was already too late to cancel the process of the emergency passport. I went to my appointment at the embassy anyway and told them what just happened. They tole me that it was fine and that I should go get my passport and come back. Cho Chu is about 130km from Hanoi, and if you are familiar with the roads in Vietnam it takes quiet a while to cover that distance. People at the rental agency Flamingo Travel were very helpful and told me I could go there by public bus, but that I would have to take 2 buses, the first to Thai Nguyen and then another smaller one to Cho Chu. That was the cheapest choice but just one way would probably take me almost a day.The other option was to hire a driver to drive me there. It cost me 1 500 000 Dong (65€ / $70), I just wanted to get this over with. The next morning the driver took me to Cho Chu where he called the police from his cell phone and a policeman showed up a few minutes later. It felt odd since we did not go to the police station but more somewhere that looked like someone's house. As I was expecting, he asked me for money righ away. I had anticipated this and withdrew some money beforehand and I highly recommend you do the same if you find yourself in the same situation. They wanted 3 million Dong (130€ / $140)!!! It seems people there feel they deserve a massive reward if they find your stuff. But this time it was not just "stuff" it was my passport. I just couldn't believe that this cop was asking me for so much, apparently it was 1 million (42€ / $45) each... What?!... yea 1 million for the woman who found it - a bit much but fair enough -, 1 million for the cop that was sitting in front of me - of course - and 1 million for the chief - Because he is the chief I guess. I almost decided to leave my passport there and get the emergency one at this point. So I started to calculate how much my passport was worth, meaning how much it would cost me if I had to do all the visas over. We finally settled for 2 million Dong (85€ / $95). I asked the driver to drop me off at the French embassy, paid him and went in. I got received by the same nice lady as before and she cancelled everything and told me to go back to the police station to cancel the police report. She really insisted that I do it quickly. It is very important because otherwise they would cancel your visa and that could get you in big trouble at the border when exiting Vietnam. So I did go back to the police station right away and tried to explain the situation as clearly as possible. You know those time when you talk to people who speak very little english and you're not sure they understood you but it should be enough anyway? there was no room for that in this particular situation, You want to make sur they absolutely understand what you mean. Luckily the women who were there spoke fair english, and repeated my situation a few times. Once I was sure they understood that I wanted them to cancel the police report I left and was happy to have my passport back with me. I might not be of big help on that one, but I thought I put a word about it anyway since they briefly mentioned it at the embassy. 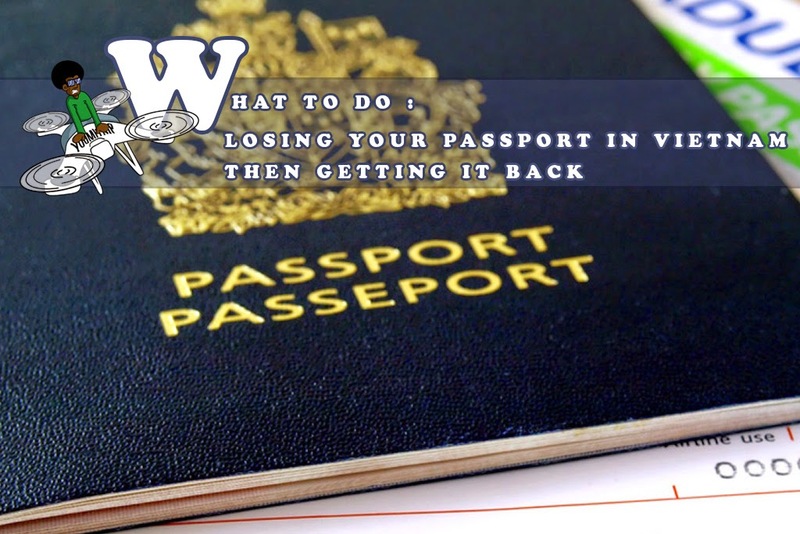 Once you get your new passport or emergency passport, your embassy/conulate should provide you with a letter to the Vietnamese Immigration Department requesting their assitance to issue a replacement visa. So you will have to go to the immigration office to ask for a new visa with your new passport and this letter, since they would have canceled the one you had on your previous passport. And yes, you'll have to pay for this new visa too. Those few days were quiet stressful but looking back I am so glad I got my passport back. And as I like to say "It's part of the adventure!"